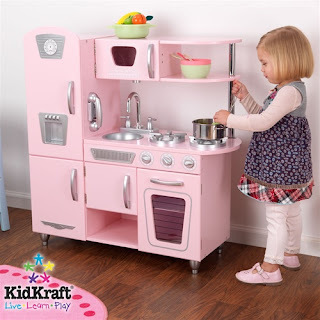 Kidkraft's marvelous Pink Vintage Kitchen has been honored with the Creative Child Creative Toy Awards 2010 Seal of Excellence. Creative Child Magazine's Awards Program is a unique program, being that all products submitted are reviewed by moms, music educators and early education professionals, and not just by any one person. This way you know it is an unbiased review. This tends to sell out in October for the holidays, so it is highly recommended to order this as early as possible to ensure you will have it in plenty of time for holiday gift giving.